Ritual Room: Goodbye Chris Cornell, and thank you. Goodbye Chris Cornell, and thank you. In case you haven't noticed, there hasn't been any writing from me on this site for years, but Chris Cornell's death has brought me back here. I started this blog in 2009 as an outlet to share my love of heavy music. That love began because of Chris. 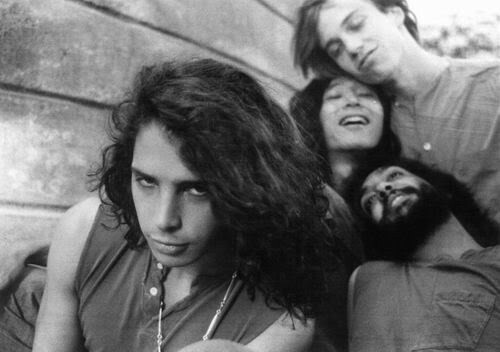 I can clearly remember sitting at the kitchen table and listening to the radio as a kid when Soundgarden's Blow Up the Outside World came on. Not to sound dramatic, but that moment truly changed my life as a young person who had never heard anything like that. To me, at that time, it was everything. I stood close to the speaker and took it all in. I became obsessed with each song and Chris's words. Honestly, I could probably write many pages about the huge impact his music has had on my life. All the times I turned to it -- highs, lows, and everything in between. It opened the door to, and set the standard for, all music for me. But it was also about more than just that. I, of course, never knew anyone in the band personally, and can't imagine what Chris's family and friends are going through. But as a fan I feel like a piece of me is missing now all the same. I think anyone who idolized a band or musician during their most vulnerable and self-seeking years can attest to this. Chris's art helped shape the person I am today, at 27, and I will forever be grateful for that and the many ways in which it has influenced my life. When I heard the news about his death, the first thing that came to mind is a story I once read about the meaning behind the song Like Suicide. That Chris wrote the song after a bird flew into his window and broke its neck, and he put the animal out of its misery by smashing its head with a brick. I was in shock for a few days. I have been sad about the loss of musicians before, but this feels much different. Heavier. My heart is broken by the way it all ended. Everything I was feeling hit me all at once a couple days after the fact, when I was alone at home. I sat on the couch and cried thinking of how awful this loss is and how much he meant to me. I thought of the horrible way it happened, all his fans who feel like I do, and how sorry I am for his family and children. How his voice is silenced. And when I stood up, like something out of fiction, a bird flew at full speed into, and hit, my window, as if it were coming right at me. I think both of us were in shock for a moment as the bird rebounded from the window and swayed. lovely post man. This one it me really hard too, and keeps coming back to get me. R.I.P.